One of the few phrases I know how to say in Spanish is “café con leche”. The literal translation of this phrase is coffee with milk. We also often use phrase Spanish latte. Today, I will explain how to make Spanish latte at your home. This easy recipe I will write about is the recipe that I saw at my friend’s house when I was at Spain last summer. He prepared it for me and I really enjoyed it. 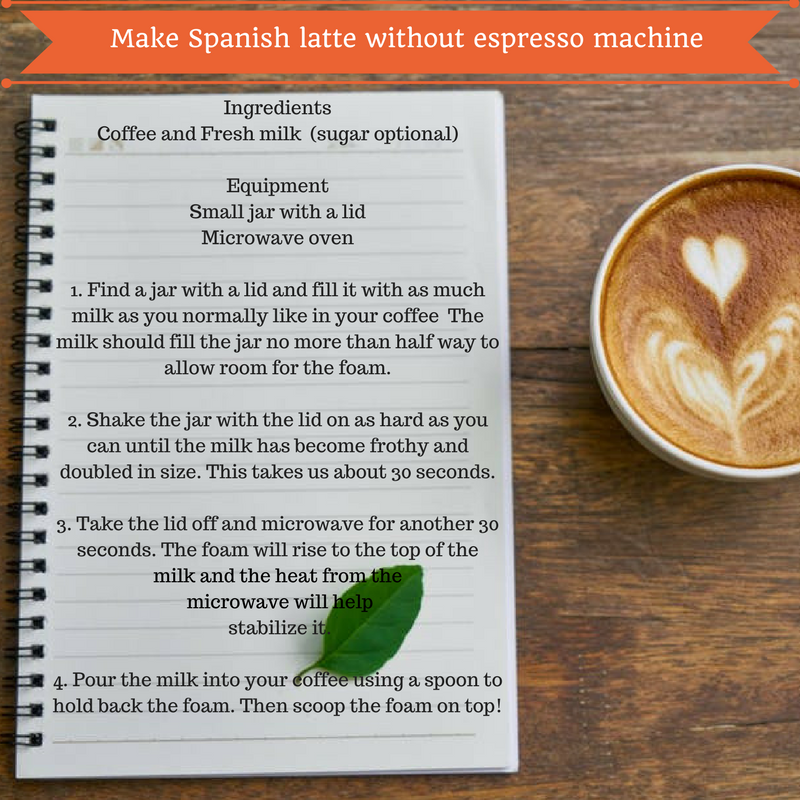 Read and learn more about Spanish latte before making it. What is Café con Leche or Spanish latte? Spanish latte or Cafe con leche is 2 espresso shots with steamed milk. There is a huge number of different coffee drinks with the milk and the biggest difference between them comes in a different amount of milk that is added to coffee. Other difference is that in different parts of the world the same coffee drinks have different names. You can ask yourself is there any difference between cafe con leche and latte? Spanish latte is different from ordinary latte because it was made without micro-foam. Café con Leche is one of the most popular drinks in Spanish homes and cafes. Apart from Spain, Café con Leche is often used in other parts of the world, especially in Florida and Latin America. Italian equivalent of the Spanish late is „doppio espresso macchiato caldo“. When I am in the cafes in the morning, my first choice is always double espresso. It is very interesting that the Spaniards for the first-morning coffee usually order Café con Leche. The next coffee they are drinking is espresso (Café Solo) or double espresso (Café Doble or Café Solo Largo) and they are drinking it mostly between 11 a.m. and 12 a.m. The most interesting thing is that the Spaniards drink Café con Leche after every meal and even before they go to bed. If you visit Spain do not miss their most popular coffee drink. There are certain differences in preparation in Spanish regions but mostly Café con Leche is made in the proportion of half cup of the coffee and half cup of the milk. Amount of milk can be different if you order Café con Leche en Vaso or Café con Leche de Desayuno. If you make this order you will get a large cup of coffee with more milk. Most popular coffee brands in Spain are: Marcilla, Catunambu, Dromedario, La estrella, Café Valiente, Saimaza, Bonka.. They also often drink Italian Segafreddo coffee. It is not very hard or complicated to make Spanish latte. 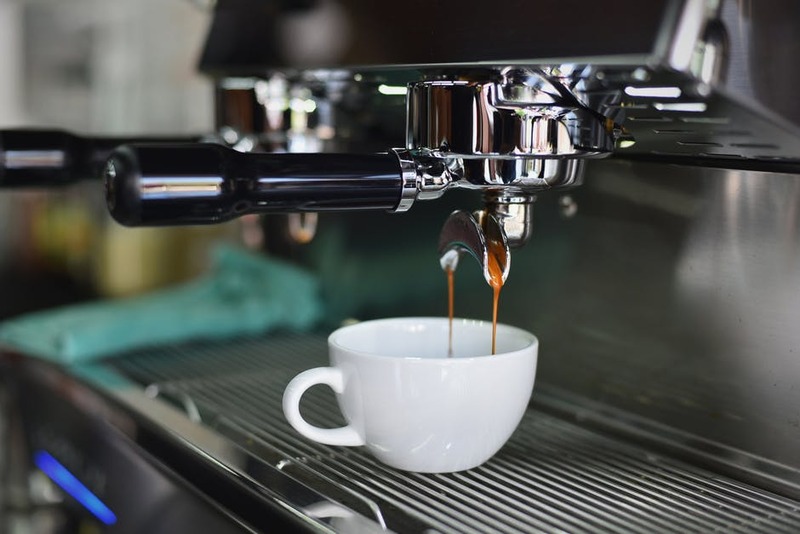 All you need is a quality coffee, it would be best to use freshly and finely ground Dark roast or some other type of coffee that gives a strong taste. You also need a good water, if you don’t drink your tap water because it doesn’t taste nice it will probably affect the taste of coffee as well. The last thing that you need is milk, you can use 2% milk, although the Spaniards use whole milk. In some variations people also use condensate milk for sweeter taste. First make double espresso, you can use espresso machine if you have it, or you can make it with stovetop espresso maker. Second, prepare milk, in some cases, people like to add sugar to milk and boil it. You can also use stem nozzle, just try not to make foam. The last step is to combine those two together. You can pour milk in coffee and boil them just a little longer. This coffee should be creamy and thick. It depends on taste, but you can use different types of coffee and milk to make your perfect Cafe con Leche. There are several variations of Cafe con Leche. When summer comes it is time for a fresh version. That is the Iced Spanish Latte. The process of preparation is basically the same. You can change the order of pouring in a cup, first, put some ice, then not so hot coffee, and then cold milk. There is no point to warm up milk in this version because you want to drink it cold anyway. In this version you brew sugar as well until it is caramelized, then you add espresso coffee and at the end, you add milk. This version is much thicker and sweeter than the other versions. How much caffeine is in Spanish latte? To know how much caffeine you have in Spanish latte first you have to know that the average Espresso shot has 40mg of caffeine. To prepare your Spanish latte at home you need two espresso shots and that means the caffeine content in this coffee drink is 80 mg. Of course, you can use decaffeinated coffee. How to make Cafe con leche without an espresso machine? If you do not have an espresso machine you can not make Cafe con leche because you need espresso shots to prepare this coffee. You can buy simple and cheap stovetop espresso maker. We recommend this espresso makers. I am sure you will enjoy every type of Spanish latte the same way as I enjoyed it last summer in Spain. It is a good habit to have a great drink at the beginning of a new day.